Wear comfortable shoes. If you park at Lot A next to the Carpenter Complex, it’s grass. To walk into Carpenter and then out and around to Brighthouse is around half a mile each way. If you walk around between the fields at Carpenter then Brighthouse, you can easily walk over two miles. Wear sunscreen! There is very little shade. Before actual games start, everything is FREE! Parking, all practices at Carpenter and batting practice at Brighthouse everything is FREE! Once games start, the practice sessions/minor league training at Carpenter are still free but on game days you must pay for parking. Be aware that Lot A will fill up early on game days and the next closest lot is at Coachman Discgolf. Parking is cheaper but it’s about half a mile up Coachman. The other alternative is DiMaggio Field at Drew and Coachman. It’s closer to Brighthouse but farther from Carpenter. Before MLB games start, training at Carpenter starts somewhere between 10-1030 with stretching, then drills and so on. Brighthouse opens at 10:30 for batting practice. Most days MLB camp ends somewhere around noon. After that, some minor league players may work out. You can bring water/drinks to Carpenter. In Florida’s sun it’s important to stay hydrated. Right now, there is a hotdog and soda stand at Carpenter, however, in years past, once minor league camp starts the stand would close leaving the only refreshment as water fountains and a single soda machine. 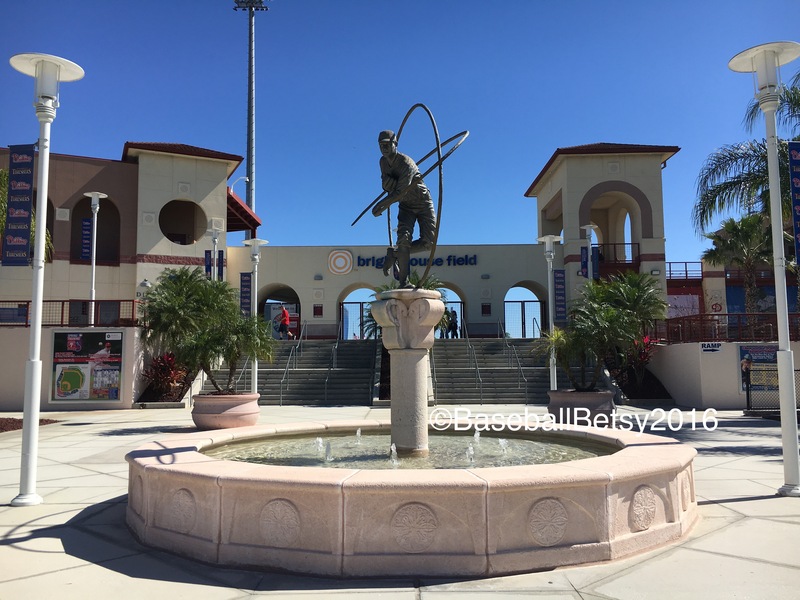 During batting practice at Brighthouse, Diamond Outfitters Souvenir Store is open as well as restroom facilities, however, no concessions are open. Just remember, players are working so just because they are walking between fields or changing activities it doesn’t mean they can stop to sign autographs. Please be understanding if they politely decline or ask you to wait until practice is over. So that’s our “how-to” guide for this year, please comment if you can think of any additional hints.